memory’ so critical in the development of proper hitting technique. hit off the tee with 3000+ cycles possible before the battery needs recharging. Portable - utilizes a rechargeable 12 volt battery similar to those used in video camcorders. Usability - the Quick-T can be used just as effectively indoors or outdoors. No extension cords are needed. Lightweight & Durable - Most of the components in the Quick-T are made from ABS plastic which is lightweight and extremely durable. Unit weight is approximately 25 pounds. Stable - Unlike stationary tees, the Quick-T has a large stable 20" diameter base which prevents the unit from moving around or tipping over from impact. Adjustable Height - with a simple twist of the wrist, the height of the Quick-T can be adjusted into one of five preset stops between 32 and 44 inches above the ground. Automatic Ball Feed - It has an automated ball feeding system, which handles baseballs, softballs, practice balls, tennis balls, wiffle balls, etc. 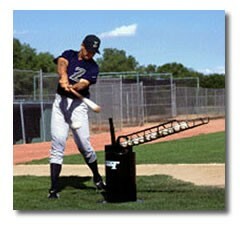 The ball feeder capacity is 15 baseballs or 12 softballs. Adjustable Speed - When set to "timed mode" the Quick-T will cycle a ball into the hitting position every 5 to 25 seconds depending upon batter preference. Using the "auto mode" the Quick-T will cycle as soon the ball has been hit. their focus and rhythm to better concentrate on mechanics. which eliminates distractions between players. study each player’s hitting technique instead of feeding each ball. as the players can all get through their drills faster. practice indoors, its 25-pound weight enables easy transport. and a portable net make for great batting practice before each game. the need for a 110V power source and long cords. pounds. The only assembly required is that the base plate needs to be snapped together. synthetic as many other tees are, and it seems to be holding up much longer. constantly, the battery should last 4 to 5 hours before needing to be recharged. Depending on its use, the battery should last a year. or later, the battery and the rubber tee will need to be replaced.